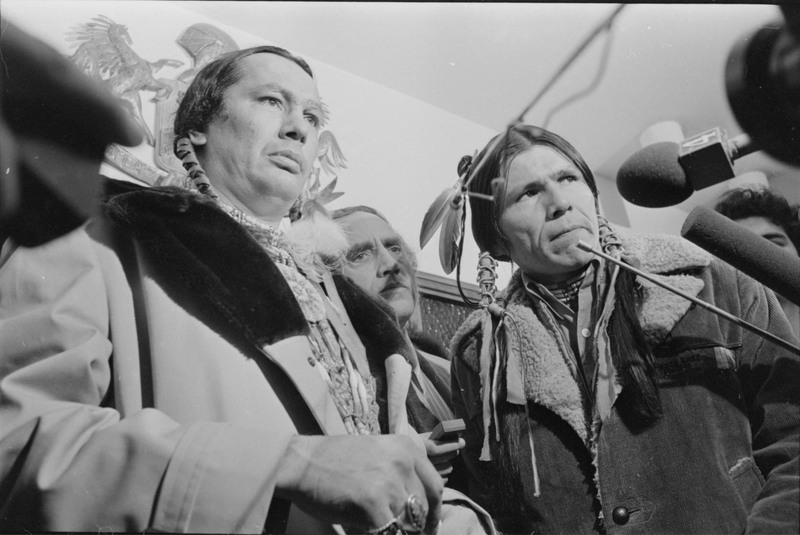 Russell Means, seen here with Dennis Banks (and William Kunstler in the background) at a press conference regarding the Patricia Hearst kidnapping at the San Francisco Airport Hilton on February 19, 1974, from the Bancroft Library’s Fang Family San Francisco Examiner photograph archive negative files. Born on the Pine Ridge reservation in South Dakota, Russell Means moved with his family to the San Francisco Bay Area when he was three, in 1942. Banks graduated from San Leandro High School, and after stints in college and working on Indian reservations around the United States, he went on to become a leader in the American Indian Movement. A Oglala Sioux, Means fought for the rights of indigenous people around the world, urging President Reagan to support the Miskito people in Nicaragua during the rise of the Sandinista government, and staging occupations at Mount Rushmore and the site of the Battle of Wounded Knee to raise awareness of Indian treaties and claims to land that the U.S. government neglected. Means was a charismatic and divisive public figure, running for the Libertarian nomination in the 1987 presidential election, and appearing in dozens of films, including a starring role in The Last of the Mohicans. Means died of cancer at his home on the Pine Ridge Reservation on October 22nd. The Bancroft Library is pleased to present the online companion exhibit to Fiat Lux Redux: Ansel Adams and Clark Kerr, which opened in The Bancroft Gallery on September 27, 2012. The online exhibit features photographs of the University of California System in the 1960s by legendary photographer Ansel Adams. These photographs — commissioned by former UC President Clark Kerr, and published in the 1967 book Fiat Lux which celebrated the educational system’s centennial — offer a rarely seen look at the evolution of the renowned University of California system through the eye of a master photographer best known for his iconic California landscapes. Fiat Lux was intended not as a document of the University as it was, but rather a portrait of the University as it would be. The Fiat Lux project was a massive endeavor, producing 605 fine prints and over 6,700 negatives, far more than the 1,000 images stipulated in Adams’s contract. After Adams’s lifetime devotion to Yosemite, Fiat Lux was probably the biggest single project of his life. The online exhibit also showcases related archival materials about the controversial Kerr himself, and the evolution of his ideas and ideals. ©1967, the Regents of the University of California, by permission of The Bancroft Library. Transmission or reproduction of materials protected by copyright beyond that allowed by fair use requires the written permission of the copyright owners. All requests for permission to publish must be submitted in writing to the Head of Public Services. The original and once-exclusive home of the It’s-It ice cream sandwich, Playland, also known as Chutes At the Beach, was an amusement park at Ocean Beach that operated from the 1910s-1972. Visitors could enjoy rides like the Big Dipper, the Aeroplane Swing, and the Ship of Joy, as well as a 68-horse carousel, a fun house with a Laughing Sal, game booths, and an enormous camera obscura (which still exists today near the Cliffhouse). If you weren’t in the mood for sugar and adrenaline, you could visit another seaside institution not far from Playland, the Sutro Baths. Operating from 1896-1966, the Baths were a gigantic indoor pool complex with six salt water pools ranging from ice-cold to 80 degrees. Less of a lap pool and more of a place to play in the salt water, you could enter the pools through slides, by swinging on trapezes or rings, or by jumping off one of the many diving boards. Non-swimmers and spectators could watch from the stadium-style seating. Over in the Mission in the late 1870s, you might spend a sunny weekend day exploring Woodward’s Gardens, located on a four-acre plot of land near Mission and 15th streets. For 25 cents you could take in live animal attractions, including bears, lions, monkeys, wolves and kangaroos, as well as the extensive collection of taxidermy animals (seen in the slideshow above) arranged in curious groupings not found in nature. As if that weren’t enough, there was an extensive aquarium, four art museums, an art gallery, a rollerskating rink, hot air balloon rides, and various live performances, including acrobatics and other feats. Finally, if thrills were what you sought, you could visit any of the Chutes locations that cropped up around the city in the early 1900s. For a dime you could take an elevator to the top of a tower, where 8-person boats awaited to plunge you at break-neck speed to the man-made lake at the bottom. In honor of the 75th anniversary of the official opening of the Golden Gate Bridge, The Bancroft Library is pleased to present “Shrouded in Mysteries,” a guided tour of the bridge as depicted on the covers of mystery, detective, and crime novels. Within just a few short years of its opening to traffic on May 28, 1937, the Golden Gate Bridge began appearing on the covers of San Francisco mysteries. The earliest known depiction of the bridge on a mystery novel occurred in 1940, on the cover of John Mersereau’s Murder Loves Company. Since then, the span has been featured on dozens of books. With its grace and beauty, and as the Bay Area’s iconic landmark, the Golden Gate Bridge immediately connects the reader to the setting of the story. Just as the physical bridge is often shrouded in fog, the image of the bridge is now shrouded with the stories told in these fictional mysteries. Our cultural obsession with cute animal photos might seem like a recent phenomenon that has flourished with sites like Cute Overload and icanhascheezburger, but photographing our pets is as old a practice as photography itself. Many of the Bancroft’s collections, from the Oliver Family Photograph Collections to California Faces: Selections from The Bancroft Library Portrait Collection include photographs of everyday-life moments that look familiar to the modern pet owner, such as posing with a beloved collie or cat. Click on the links below to explore the collections to which these images belong. Our Police Dog on Nov. 4/24 Election Day. Group portrait of men with dogs, University of California at Berkeley, Summer School of Surveying. Dog, Pekinese, named “Jet”, owned by J.P. Smith. Anita Oliver and dog, Ginger. Miss Coolbrith with cat, 1924. 56 Tarabal St., S.F. Announcing The Bancroft Library’s New Online Companion Exhibits! The Bancroft Library is pleased to announce the launch of a new online companion exhibit to the exhibition A Place at the Table, which opened today in The Bancroft Library Gallery. A Place at the Table celebrates the life and art of the LGBT community through text, image and voice. The development of this new online companion exhibit is part of an initiative spearheaded by the Bancroft Exhibition Committee to ensure an online component for all of The Bancroft Library’s rich physical exhibitions. With the support of the Bancroft Exhibition Committee and working closely in with the curators of the exhibition, the Digital Collections Unit of The Bancroft Library developed this first online exhibit using Omeka, an open source web-publishing platform. Omeka is a project of the Roy Rosenzweig Center for History and New Media at George Mason University, and is supported by UC Berkeley’s Library Applications and Publishing group. It allows libraries to upload digital collections and create complex and visually interesting exhibits. The A Place at the Table exhibit marks the first of many online companion exhibits by The Bancroft Library. We hope you enjoy them! The Digital Collections Unit Blog! Welcome to our new blog! The Digital Collections Unit (DCU) at The Bancroft Library handles all things digital at Bancroft. We created this blog to share some of the interesting work we do here in the DCU. We hope you’ll find our work as exciting as we do!